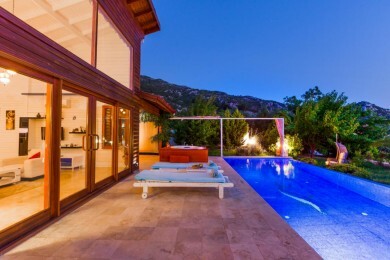 This modern and luxury villa is located in Kalkan, in the Islamlar area up on the hillside which provides panoramic views of Kalkan bay, the blue sea, surrounding mountains and the beautiful islands. 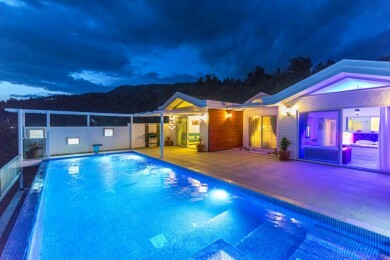 The villa has 3 bedrooms which in total sleep up to 6 people. It has been furnished with modern and top quality furniture and decor, and is fully equipped with everything you will need, with a Jacuzzi for extra luxury. 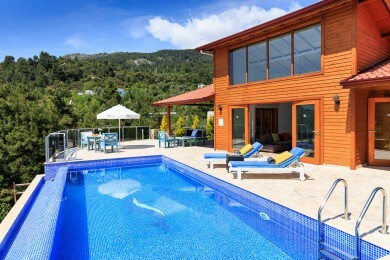 Outside the villa is a private swimming pool, child pool, and beautiful mature gardens. 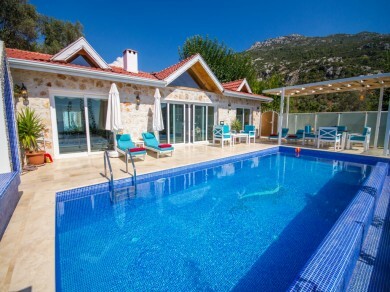 This villa can also be rented with Villa Alya, so that large groups and families can occupy both villas. Bedroom 1: Double bed, bedside tables, dressing table, wardrobe, air-conditioning, bathroom, outdoor Jacuzzi. Bedroom 2: Double bed, bedside tables, dressing table, wardrobe, air-conditioning, bathroom, outdoor Jacuzzi. Bedroom 3: Twin beds, wardrobe, bedside tables, dressing table, wardrobe, air-conditioning, bathroom, access to pool. Living Room: open plan living room with kitchen and dining area, comfortable seating area with LCD TV, DVD player, access to pool terrace. Kitchen: fully equipped with fridge, freezer, oven, hob, dishwasher, washing machine, microwave, cutlery, crockery, utensils, glassware, ding table and chairs. 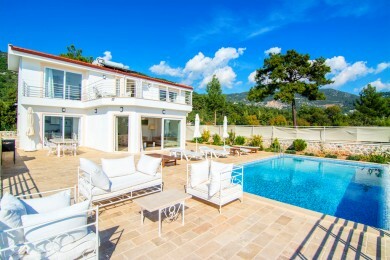 Outside: private and secluded swimming pool, child’s pool, terrace with sun loungers, parasols, hammocl, pergola, outdoor dining furniture and BBQ, pool. Pool dimensions: Length 13 m, width 5 m, depth 1.5 m.
Note: there is a 300 metre gravel road leading up to the villa.